We can probably all agree that summer didn’t bring the weather we’d hoped for and now, with autumn firmly here, many of us can’t bear to face the winter months. So, at uSwitch we’ve decided to look forward to next summer instead of facing up to the reality of the chilly days ahead. Used for security but also as an on/off light when you go into the garden at night. It has three double sized LEDs so it’s capable of flooding an area of 16smq with light. These stunning solar lights will make your garden even prettier in the summer months. With their beautiful design, the luminescent crystal and state-of-the-art white LED solar light appears to float in the air. We’ll be dotting these around our flowerbeds and ponds as soon as soon as spring hits -delightful. There’s nothing better than sitting in the garden on a warm summer’s evening and chatting to friends over a bottle of wine. You might light few candles too, but these have to be replaced and can often leave wax over your best patio table. With the POWERplus Dragonfly you can get the pleasure of a candle but the hassle- free convenience of a solar light – it mimics a candle; flickering under the moonlight after being powered by the sun. These solar garden lights are perfect for lighting up the garden path or drive. Made with a stainless steel body and shatter-proof glass, they’re durable enough to keep outside and their solar panels will last for two years. Who says that the end of summer and festival season means that we shouldn’t get out into the open air and camp throughout the winter? The wind may be enough to blow your tent away, you may experience torrential downpours and maybe even snow. But as long as you’ve got the gadgets to get you through any tricky situation then you’re quite happy, right? This is the ultimate camping tool. It has a torch, a USB charger, an audio line output (AUX), a built in flashlight, a weather band radio and even a bottle opener for those crucial beers! With a traditional look and durable build, the bear can be charged through four different power sources. It has an impressive 24 LED light which means that the light will shine for up to four hours. Plenty of time to get your camp fire songs in before lights out. The solar and dynamo powered Lynx may have a stylish white finish but it is certainly not just a pretty face: the heavy-duty radio with AM and FM frequencies looks like it’s ready to take on just about any weather condition and it’ll also charge your mobile phone. When you’re exploring the great outdoors you’ll probably be on the move a lot, which is why the POWERplus Cobra is so useful – you can attach it to your backpack during the day to collect optimum solar power and charge your gadgets as you go. It may be a stylish weather station for your home, but you can take this on your adventures too. It’s solar powered so there’s no need for batteries and it’s a great gadget to have when planning those weather dependant activities. The AEA, a climate change consultancy, has been watching us and how we adopt new renewable energy measures, such as solar panels, Feed-in Tariffs and wind power. Today it published its regional results and some of them have been more surprising than others. For instance, the North has proved a lot more proactive in taking up renewable energy schemes and showed the biggest uplift in renewable energy generation since the Feed-in Tariff (a government incentive that pays ypu for generating your own energy) was introduced. On the other hand, homes and businesses in major cities such as Manchester faired a lot worse, coming bottom of the table. Scotland was the winner for wind turbines. 14% of renewable energy is in wind power and Aberdeenshire alone has implemented 3.7% of the UK’s total. However, it was Sheffield that shone as the leader in renewable energy. Of the 10 largest cities in the UK, it was Sheffield that beat other major cities, including the countries capitals for the most installed renewable energy measures. In total, it achieved “over eight times as much installed capacity/1,000 population as London and fifteen times as much as Manchester”. The capital failed even to come second or third in the table, with Leeds and Bristol taking those places respectively. By measuring how many KWe (kilowatts of energy) each city produced divided by its population, the AEA has given us a good ratio of which cities are adopting renewable energy the most. 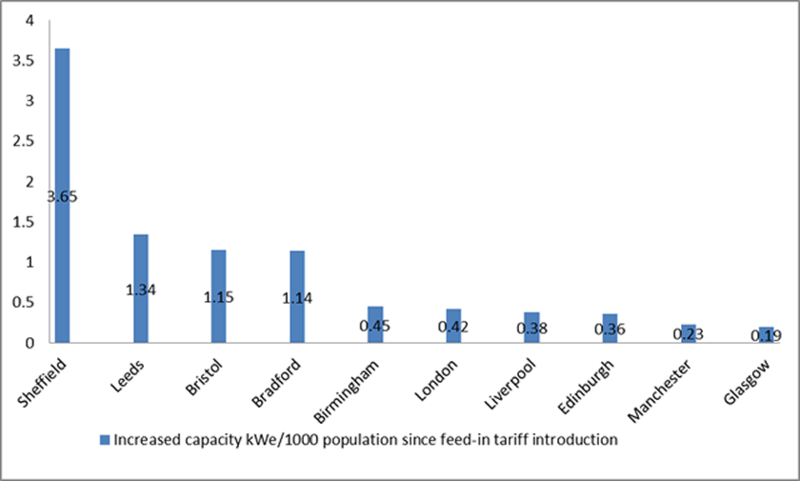 For instance, Sheffield has increased its capacity by 1,997, which is an average of 3.65 KWe per 1000 people. Although London might have produced the most KWe at 3,242, when divided by 1000 to put it in context of its population, it fairs a lot worse. It’s not just individual households that are taking advantage of government incentives to go green – measures, such as the Barclays £100m fund to help farmers pay for projects has led to large-scale renewable energy projects around the UK. 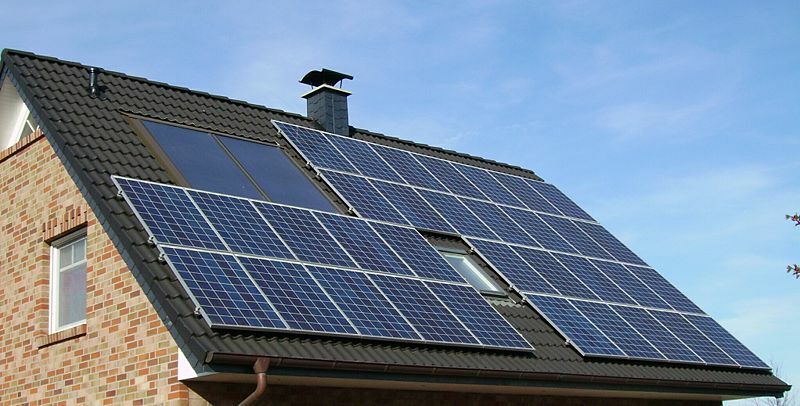 Councils have also pushed for social housing to create more energy-efficient houses, thus increasing the scope of renewable energy across a range of communities. Perhaps this is a ray of hope for the 6.3 million people currently living in fuel poverty.